Ah, sequels. Seems like "Die Hard" could be a sequel right? Let's face it: the first one was successful with fans, critics and at making money, it involves good characters and features a lot of violence that is sure to appeal to some key demographics. Yeah, I think "Die Hard" could be a sequel. And it obviously was if you read the the title of this review. "Die Hard 2: Die Harder" takes place exactly one year after the original. Christmas Eve, a lot of terrorist bad guys, returning characters, action, explosions, scares, guns... sounds like the original, right? Only this time it's with planes. So, John McClane is meeting his wife at the airport in Washington D.C. (*COUGHreplacedforachristmaspartyCOUGH*) when you guessed it, trouble errupts. Terrorists led by Colonel Stuart (William Sadler) take control of Dulles Airport's landing system. Of course, people are going to die and get hurt if their demands to free a drug lord are not met. However, McClane's wife Holly (Bonnie Bedelia) is circling over head. With limited fuel, guess who has to save the day? "Die Hard 2" has drawn comparisons with the original, and when you think about it, they are pretty similar, but I still think they have their differences to make them stand on their own. This sequel at least sort of mocks the same occurances, so at least Fox doesn't think we're all idiots who go in and eat up anything they serve us. Still, since I was a big fan of the original I thought this sequel was an incredible continuation. What I liked was how the plot was really kept consistent and a lot of the great supporting characters from the original returned when you may not have expected them to. There is also some more memorable dialogue in addition to even greater action sequences that seem to be on a bigger scale. Add in some great confrontations, nice twists and some great, thrilling scenes and you have one entertaining movie. Once again, Bruce Willis returns as John McClane and he's great. He adds more to character since McClane has added conflict between the bad guys and those around him, not to mentuon an even smaller amount of time to work with. Dennis Franz is great as Captain Carmine Lorenzo who just adds more to McClane's troubles. Sadler as Stuart is excellent with a nice meaness and toughness, and old favorites such as Bedelia, William Atherton and Reginald VelJohnson return. Too bad Carl Winslow has such a small role. Harlin's directing skills here are top notch and the editing is nicely done so we don't lose any of the action. Considering the film was shot and edited quickly, it's mighty impressive. Personally, I think "Die Hard 2" is Harlin's best film yet... I don't think what he did mostly after was so good, but I consider "Cliffhanger" an exception. Complete with a "Simpsons" cameo (YES! 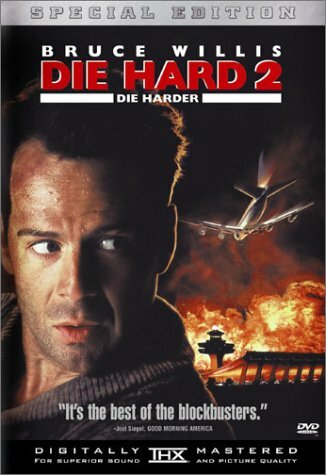 ), "Die Hard 2" is a sequel that doesn't quite live up to the original, but still a great movie in its own right complete with some spectacular stunts and sequences. The THX certified is an improvment over the original release's non-anamorphic transfer. Thankfully, this time aroumd, the transfer is anamorphic and in the original aspect ratio of 2.35:1. While I was a little disappointed with the "Die Hard" Five Star Collection transfer, I was a bit skeptical about this one. It really blows it out of the water and they really cleaned this transfer up, it was quite a nice surprise. Colors are perfectly saturated and black levels hit the mark perfectly as well. I didn't notice much grain and some blemishes as they pop up here and there, as well as shimmering, but they go fast and aren't major so no one is really going to notice them. I noticed some slight edge enhancment too, but still, nothing that is really distracting. This definently ranks as one of Fox's best transfers ever and is sure to please. "Die Hard 2: Die Harder" features English Dolby Digital 5.1 and DTS 5.1 tracks (the original DVD release only had Dolby Digital 5.1). Like the first "Die Hard" movie, there's a lot of action sequences that will show off any home theater system nicely (what? you were expecting a dialogue driven movie?). Like the video, the audio is THX certified as well. From the fantastic finale to some major explosions, this movie packs quite a punch with the audio. Dialogue is clear and easy to hear and isn't overpowered from some giant effects. There is some nice mixing, and the Dolby Digital and DTS are really neck and neck, but I have to go with the DTS ever so slightly. Like the original, this is an action movie with a lot of action, fights and sounds that really pump up your speaks. .1 LFE extension is great and in the end, no major complaints. English Dolby Surround and French Dolby Surround tracks are included, but English subtitles, English closed captions and Spanish subtitles. Though it is a two-disc set and packed with features, this re-release of "Die Hard 2: Die Harder" is not a Fox Five Star Collection release but a special edition (I'm guessing because it's not as packed as the original "Die Hard"). Still, don't let that be a turn-off to you. There are still some great supplements that will please fans of the film. The first disc features an Audio Commentary with Director Renny Harlin. Out of all the Die Hard DVDs, I enjoyed Harlin's comments the best. His accent may be a bit of a turn-off to some, but you get used to it fairly quickly. He starts off by talking about how he got to direct the film, as well as some very interesting tidbits about the production. He usually stays pretty screen-specific and actually points about some mistakes the film has. Despite the movie being well over ten years now, it's nice to know he remembers so many little details about the production. Don't miss this track, it's very entertaining as well as informative. Also on the first disc is THX Optimode, plus the usual Fox Promo trailer before the main menu. Moving on to the second disc we have Die Hard: The Making Of Die Hard 2 which lasts a good twenty-three minutes and was shown on the Fox network all those years ago. It has behind-the-scenes clips, a variety of interviews and clips from the first movie as well as the second. It's a bit fluffy, but a lot better then the usual featurettes. It's presented in full frame and really has some interesting production facts. The interviews include Willis, Harlin, William Sadler, Bonnie Bedlia, among others including more of the cast and crew. It's a nice watch. The four minute Featurette was used for Fox's EPK for the film, and also has behind-the-scenes clips, interviews and clips from the movie. A lot of the same stuff is in the TV special, so watch that instead. You have Four Trailers, all in anamorphic widescreen and why the section heading says "TV Spots", there's only one in full frame. It's interesting how they delayed the film from June 29th to July 4th. In the Deleted Scenes section, you're treated to four of them in non-anamorphic widescreen. They actually look really sharp and are in two channel sound. They add up to be around eight minutes, and these actually are expanded or alternative scenes. They make nice additions. An Interview With Renny Harlin is included and has clips from the film, behind the scenes clip and the interview seems to be on the set. William Sadler is also interviewed for this, and why Harlin gets his name in the title only is beyond me. This looks like an edited version of what's in the featurette and making-of special. Villain's Profile also has behind-the-scenes clips, clips from the movies and a variety of interviews with Harlin, Willis, Sadler and others. It's more making-of stuff and kind-of fluffy. After seeing the other making-of materials, this gets old fast. Behind-The-Scenes and Storyboards has a four minute featurette entitled Breaking The Ice which has clips from the movie, more behind-the-scenes footage, storyboard footage and interviews with Willis, Harlin and others. It's interesting to see how this was exactly set up and put together. The same goes for the nearly eight minute Chaos On The Conveyer Belt which also has behind-the-scenes footage, clips from the movie and interviews. You really see Harlin hands on here which is nice. This featurette relies more on actually behind-the-scenes footage. I liked this one the best of the two. The Story Board Sequence goes back and forth between storyboards and the film clips which works nicely. Finally, the Visual Effects section breaks down the Ejector Seat scene (three minutes) with storyboards, blue screen and the final shot. The Airport Runway scene (nearly two minutes) has the paintings of the sequence compared to the final composite shot. The Chopper, Airplane Models and Wing Fight show how they were made and setup to how they were all completed for what's scene in the movie. Very interesting. It uses split-screen often. Finally, the animated menus really fit into the film with some great transistions, sounds and graphics, just like the first "Die Hard". Though not as featured loaded as the original, there are still some damn fine supplements for this sequel in addition to a fantastic presentation and is worthy of a special edition banner. This makes a great companion to the first film and worth picking up. And while many argue it's more of the same when put next to the first film, it's still a really enjoyable ride.